Baer and Miskell, both retired from the Cincinnati Library, played the wives of leading abolitionists Levi Coffin and Calvin Stowe. Mr. Coffin was a pioneer conductor on the Underground Railroad. Stowe’s father, the fiery Lyman Beecher, headed Cincinnati’s Lane Theological Seminary. His daughter Harriet married Calvin Stowe and later wrote Uncle Tom’s Cabin. The actresses performed a well-rehearsed dialogue that explained their roles toward emancipation. Though they never went out of character, their script occasionally provided historical context. The two characters lived in Walnut Hills and held similar views. Baer and Miskell, however, acknowledged in the Q & A they found no documented proof of an actual friendship, but felt such a relationship a foregone conclusion and thus worked it into their script. Emotional and life-changing experiences dominated their dramatization. Coffin misled a US Marshal and two southern planters in search of runaways and she hosted an escaped slave who crossed an icy Ohio River in search of freedom. Stowe explained her journey from Boston to Cincinnati then back to New England. Nearer the South she became exposed to the evils institution from signs offering rewards for runaways to an auction in Kentucky that separated a slave family. Upon her return North, the public indifference to the institution’s evils encouraged her to write her influential novel. After an intermission, a more recognizable character explained his life from a small Kentucky farm to issuing the Emancipation Proclamation. Wernz, a former music teacher at North College Hill, has played Lincoln since 1969 and has appeared in character in two films. In his full biography of Lincoln from child, to legislator, to president, he focused on key turning points in the Rail Splitter’s philosophical evolution with a Cincinnati perspective. He cited occasions when he had come to the Queen City first as a litigator and later as a candidate. The actor resembled the image of Lincoln, save his height, dressed in period clothing, white gloves, and bow tie. His monologue explained the developing Lincoln ethic, events that earned his nickname Honest Abe, and how he despised slavery. 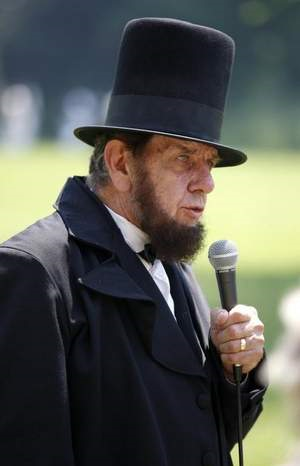 As Wernz recited lines that explained Lincoln’s concern for slavery and for Union, tears nearly came to his eyes. Like the actresses before him, he occasionally provided landmark dates for chronological context. 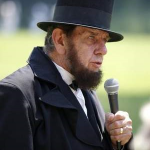 And, like the real Lincoln, he worked in the sixteenth president’s humorous lines. For those who ever claimed he was two-faced, he retorted, “If I had a face other than this, would I wear this one?” These performers mimicked the speech and dialogue of the past, had clearly done their research, and went completely into character.